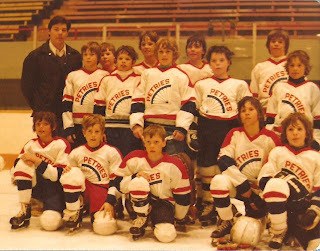 In my younger years started playing organized hockey in the Westfort Hockey League in the Atom age group for the Pipe Trades 628 and in Peewee for IGP (Industrial Grain Products) and the Kiwanis. 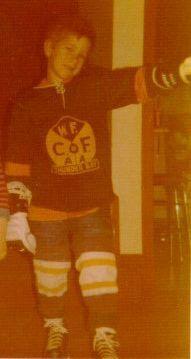 Played one year of Bantam for the Westfort Maroons. 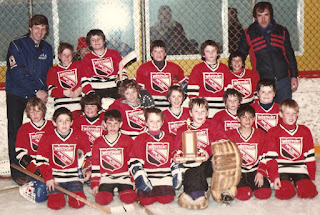 Played almost exclusively defence (except for being put in goal in Atom for 2 games when goalie was either sick or injured). 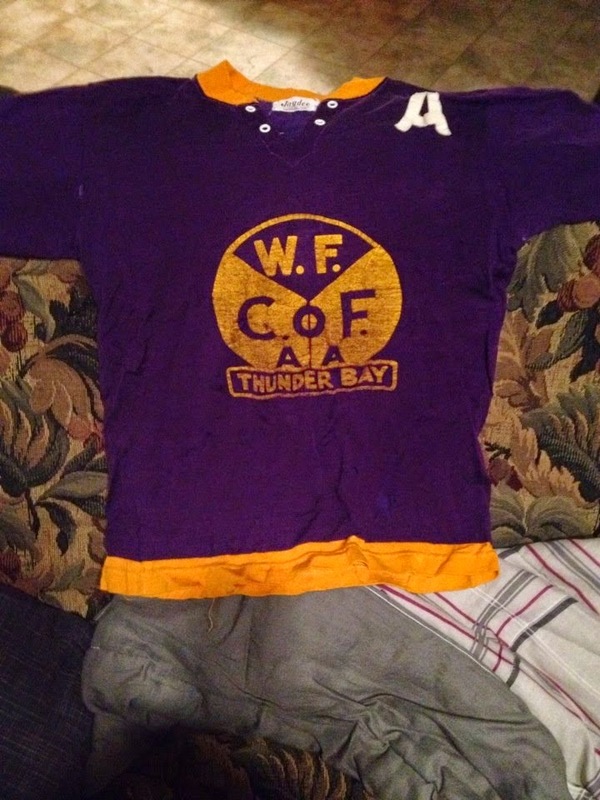 In the first few years on the Pipe Trades wore purple and gold dureen (cotton with nylon or rayon) sweaters. Have one badly faded team photo and one personal pic. 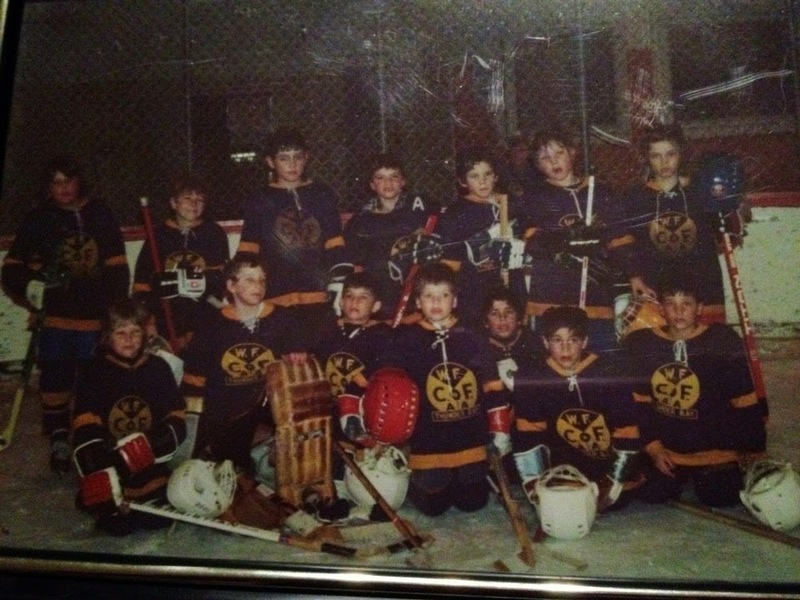 Back when I started playing organized hockey some games in the Westfort League were played on outdoor arenas and some on indoor arenas. 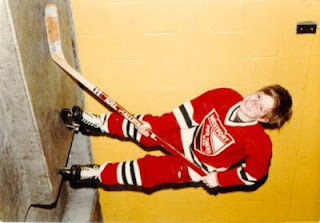 We usually didn't get to keep the sweaters back then; they were used year after year. For my final year with the Pipe Trades team we changed to a red polyester jersey. 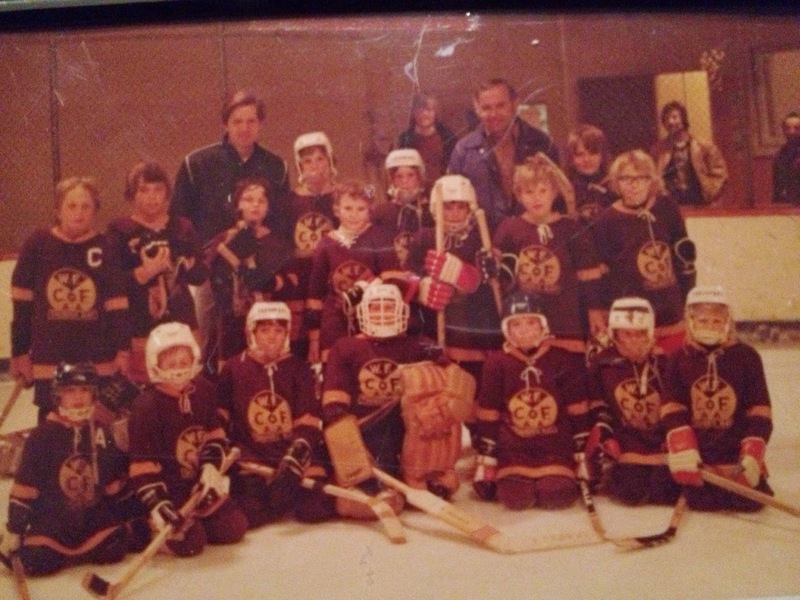 I believe I was #6 that year. 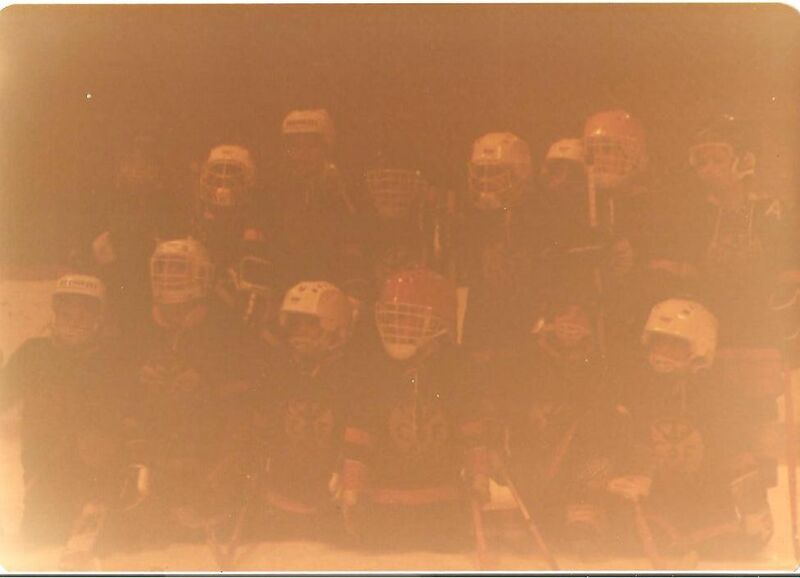 Here's another team pic and personal from the 1977-78 season. I am in the top left corner next to my dad who was one of the coaches that year. Both pictures were very likely taken at Delaney Arena. None of my trophies survived several moves, but I kept the plates that were on the trophies. 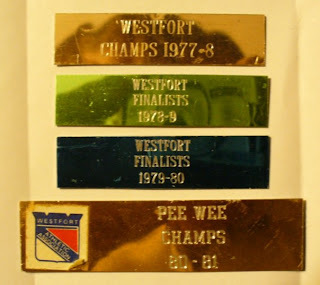 While at one of the local library branches I looked through some old local papers on microfilm and found some information on the 1977-78 playoffs. We beat the Hansford Hustlers 4 games to 1 in the championship games: 1-5, 4-3, 3-2, 3-1, 3-2. Don't have any pics of the Pee Wee or Bantam years, but have one pic of what I believe is likely a team pic of the year I was on the all-star team. 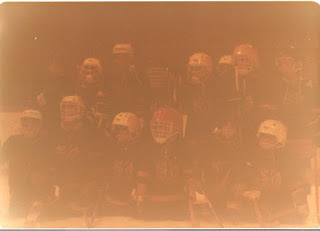 We played in a tournament in Nipigon/Red Rock. Got some photos from Kevin Wright of the Pipe Trades. A couple team photos and the sweater he has. 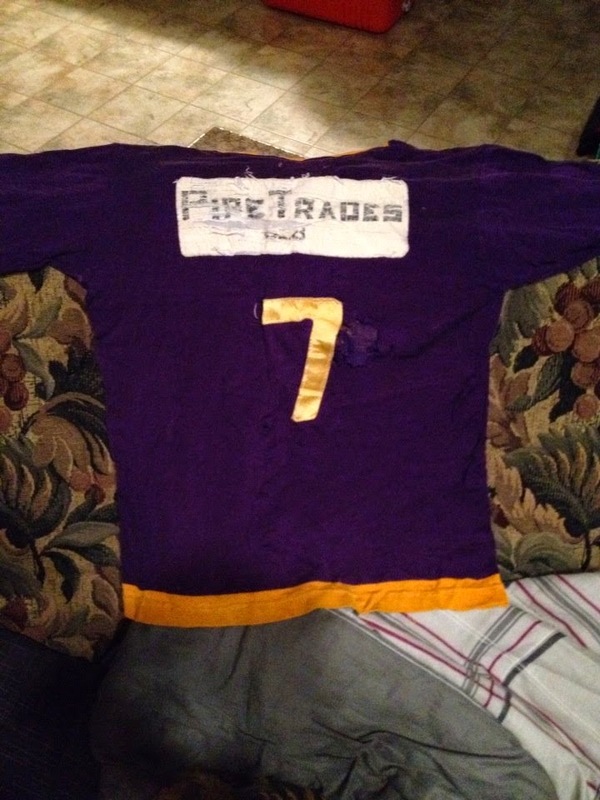 Kevin Wright has some team photos and sweater photos of the purple Pipe Trades on Facebook (a lot better than my purple team photo). He also has some team photos of some other Westfort teams. I'll add the purple Pipe Trades ones to this blog soon.